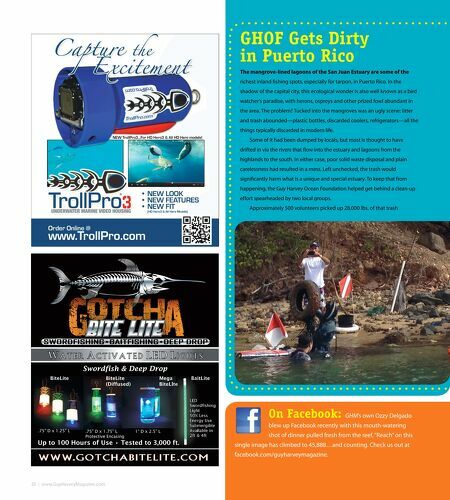 GHOF Gets Dirty in Puerto Rico The mangrove-lined lagoons of the San Juan Estuary are some of the richest inland fshing spots, especially for tarpon, in Puerto Rico. In the shadow of the capital city, this ecological wonder is also well known as a bird watcher's paradise, with herons, ospreys and other prized fowl abundant in the area. The problem? Tucked into the mangroves was an ugly scene: litter and trash abounded—plastic bottles, discarded coolers, refrigerators—all the things typically discarded in modern life. Some of it had been dumped by locals, but most is thought to have drifted in via the rivers that fow into the estuary and lagoons from the highlands to the south. In either case, poor solid waste disposal and plain carelessness had resulted in a mess. Left unchecked, the trash would signifcantly harm what is a unique and special estuary. To keep that from happening, the Guy Harvey Ocean Foundation helped get behind a clean-up efort spearheaded by two local groups. Approximately 500 volunteers picked up 28,000 lbs. of that trash Swordfish & Deep Drop BiteLite .75" D x 1.25" L BiteLite (Diffused) .75" D x 1.75" L Protective Encasing Mega BiteLite 1" D x 2.5" L Up to 100 Hours of Use • Tested to 3,000 ft. BaitLite LED Swordfshing Light 50% Less Energy Use Submergible Available in 2ft & 4ft On Facebook: GHM's own Ozzy Delgado blew up Facebook recently with this mouth-watering shot of dinner pulled fresh from the reef. "Reach" on this single image has climbed to 45,888…and counting. 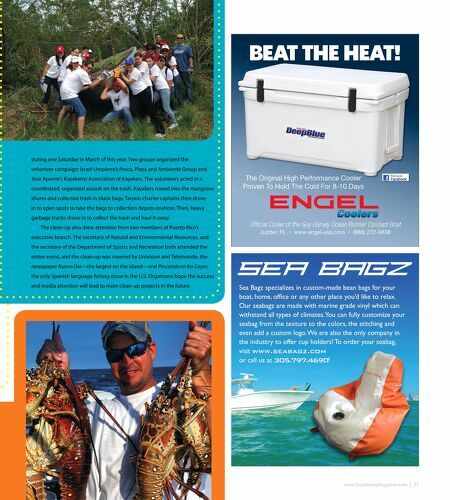 Check us out at facebook.com/guyharveymagazine.